In February 2011, she was interviewed for her book. The interview is featured on a site among approximately 20 other authors, several of whom are NY Times Bestsellers and / or award winning recipients. She is beyond honored and blessed to be in the company of such incredible talent. With such prestigious influences in her midst, Schmidt was inspired to publish "Dreams of the Heart vol. II" in August 2011. Also, in 2011 Schmidt's poem "Iridescent Sunrise" was published in "Poets Amongst Us Aquillrelle Poetry Three: An Anthology. Upon, reading poetry at an open mic event organized by "Writer's Row" founded by Jessica Wilson, that took place in downtown L.A.'s "The Last Bookstore", and meeting prolific poets who had written 20+ books, she was further inspired to achieve such levels of realized productivity. Currently, she is writing the novel series of her dreams. Her north stars are authors of unparalleled success like JK Rowling and Agatha Christie. Some of the authors she holds dearest to her heart include Shakespeare, F. Scott Fitzgerald and Robert Frost. Throughout the time that she has been pursuing her writing dreams, she has independently published over 800 poems and articles. Her online writing has been viewed close to 900K times, with approximately 4.4K fans, her poem "Wisdom & Youth" and an interview was been featured in two separate issues of "Christian Women's Magazine", her poem "Bricks & Passages" has been published by Edgar & Lenore's Publishing House, her biography, picture and "Dreams of the Heart" have been added to this same publishing house's "Calliope's Closet" collection, her radio interview was featured in "Aquillrelle Magazine", and her poem "Greater Good" was featured in CWL xPress' new in-print magazine in August 2011. Additionally, Schmidt feels honored and blessed to have been a performer/poetry reader for the 2011 Poetrypalooza (a 10-day citywide poetry celebration in Los Angeles - held by the ZZyZx WriterZ a new emerging LA based writing group (consisting on such talents like Kimberly Cobian, Henry Chow, and more! ), that teams up with local artists, musicians, actors, educators, and more writers). In November 2011, she was honored and humbled by being asked to contribute her poem "The Touch of a Snowflake" to Conneticut's largest independent poetry group Free Poets Collective' s Ekphrastics book of poems for The New Britain Museum of American Art (to be published in 4/2012). She was also humbly honored with the gift of becoming an administrator for "Free Poets Collective." In February 2012, she was contacted by the publishers of "Pho for Life" and asked to contribute poetry/writing to the second edition "Miso for Life". The editions are collections of Asian writers to celebrate, support and uplift the Asian community. . In June 2013, she was asked to participate in the upcoming "Asian Pacific Festival: Arts & Music by the Sea" taking place at the Newport Dunes Waterfront Resort in September 2013. In May 2014, 3 of her poems were published in the third anthology series of Asian writers "Kim Chi for Life". 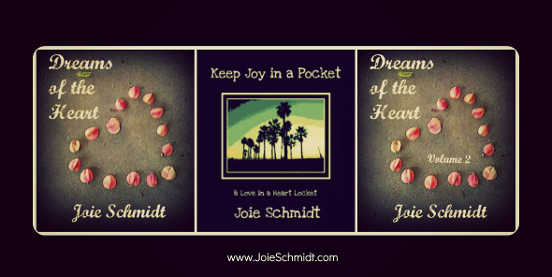 Also in 2014, Schmidt created "Keep Joy in a Pocket & Love in a Heart Locket" inspirational stickers. (Readers' Favorite receives "thousands of entries from all over the world" & "submissions from independent authors, small publishers, & publishing giants such as Random House, Harper Collins & Simon Schuster, with contestants that range from first-time, self-published authors to New York Times bestsellers like J.A. Jance, James Rollins, and #1 best-selling author Daniel Silva, as well as celebrity authors like Jim Carrey (Bruce Almighty), Henry Winkler (Happy Days), and Eriq La Salle (E.R., Coming to America)." In 2018, Schmidt became a verified Amazon Influencer and feels beyond honored and blessed! Check out her storefront where she her faves & recommendations as well as her promo codes for up to 70% off on incredible deals "Joie's Amazon Storefront" Also, in 2018 Schmidt finally started a dream of hers to begin putting her poetry on videos (audio) so all can enjoy her work free of cost. Additionally, she'll be sharing a variety of videos on different topics. Feel free to listen and subcribe here "Joie's YouTube Channel" She has also been blessed with new opportunities to partner with quality partners and feels grateful and humbled.